Sauté the bacon and onion in the pot with Cobrancosa Olive oil, then to the mixture add the chopped linguiça and lastly the garlic. Add the diced tomatoes, tomato sauce and the spices, omitting the salt and pepper until after the beans are cooked. Secure the lid. Using the bean setting, begin the cooking. It takes about 30 minutes. 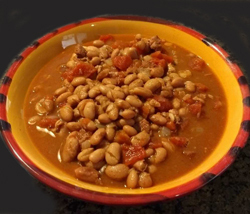 When the timer goes off, release the steam, open lid, add salt and pepper to taste and enjoy the delicious taste of this humble bean recipe. Follow the directions above, but keep checking the liquid level. Adding water may be needed. Simmer at low heat for about 3 hours until done. Season with salt and pepper to taste and enjoy. Note The style of cooking of these beans comes from the Azores. My grandmother's family came from Madeira and she did the cooking in her family. My grandfather's family came from the Azores, but unfortunately we didn't grow up with the cooking of his family, so I didn't discover these beans until recently. I just love the cinnamony flavor in the beans. Can't keep away from them!